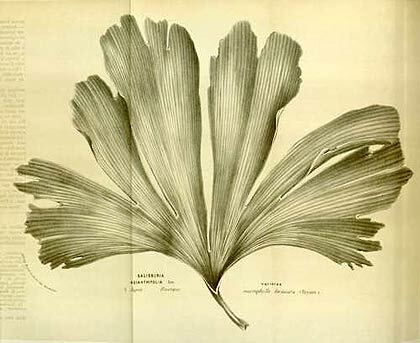 Old botanical illustration (1855) of Salisburia adianthifolia, synonym for Ginkgo biloba L.
Illustration from the journal by L van Houtte, Flore des serres et des jardin de l’Europe, vol. 10: p. 119, 1855. Large picture to download on Botanicus.org. More info about the name on my website: The Name.